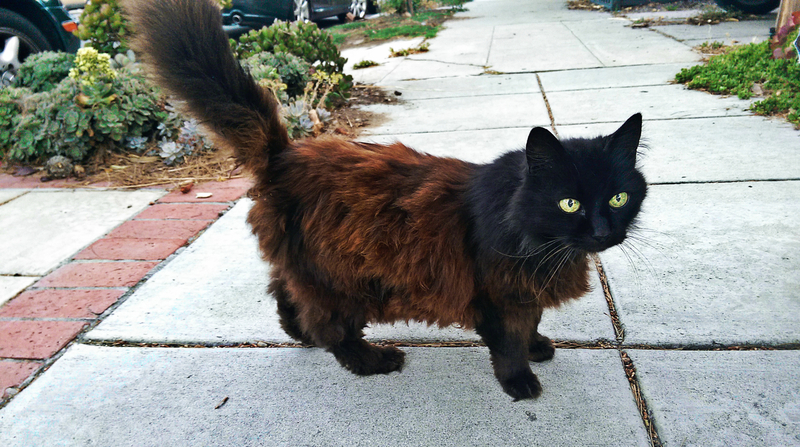 I snapped this cat around sunset under overcast skies using HTC One M8. Both renditions are cropped. The left is otherwise untouched. To the right, I applied the phone’s UFocus feature. The One uses a duo-lens system to capture photo and additional depth information. 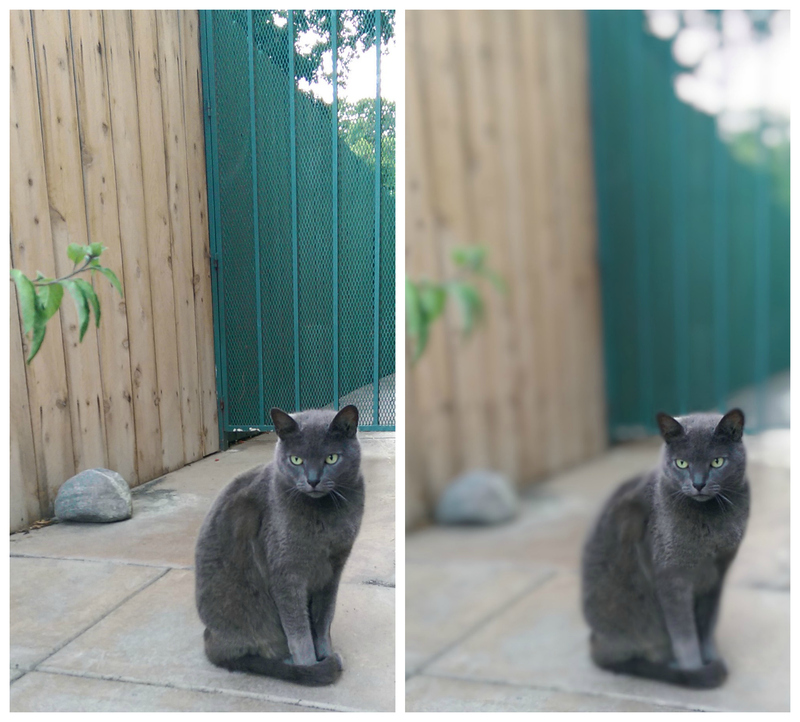 I applied depth-of-field centerpoint to the cat’s face, which blurs rest of the image. I cropped afterwards. UFocus can also change the focal point, even after shooting. Quite a few reviewers ding The One for having only a 4-megapixel camera. I shake my head and laugh. Look back a few years when 4MP was state of the art, and the same reviewers raved. Here’s the problem I see: Relativity. Making relative assumptions about A to B. Not long ago people praised 4MP for printing large photos, close-cropping, etc.—cited criticisms today. Now that there is 8MP and greater, 4MP is looked down upon. Too much attention goes to examining detail when the photo is magnified close in. Reviewers should instead look at the overall picture. The HTC camera is by no means perfect, but its low-light performance is excellent, The phone packs a 2.0µ pixels sensor (1.1 is typical). The f/2 lens coupled with the larger pixels make a difference. 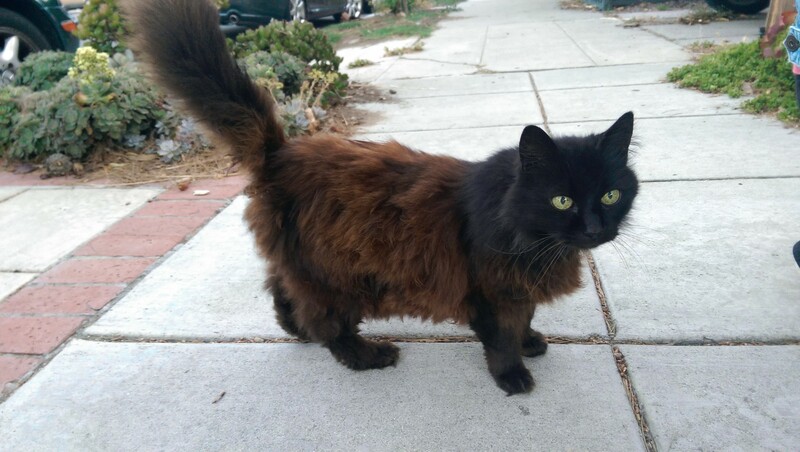 Take a look at this cat taken about within minutes of the other. At sunset: f/2, 1/30 sec, ISO 200. I’ll tell you something most phone reviewers don’t understand: For these small sensors, 5MP is the most you want. Cramming more pixels onto the same surface area causes all kinds of image aberrations. HTC, and also Apple (iPhone 5S, 1.5µ pixels sensor), takes the right approach by offering larger pixels. The other option would be putting in larger sensors. Take a look at this spider at dusk taken with Samsung Galaxy Nexus (5MP, in 2011). Or this album of pics taken with Nokia N97 (also 5MP, in 2009). I shot all of Comic-Con 2012, using Galaxy Nexus. Another problem I see with phone camera reviews: What is perceived as good, such as rich contrast and saturation isn’t true. Take a look at my Sigma DP1 and DP2s albums. The unique Foveon sensor captures colors and contrast more as the eye sees. Of all the smartphones currently available, Moto X best captures what the eye sees. If low-light performance was better, the Motorola likely would be my phone of choice. I need to shoot indoor events, where low-light performance without flash is crucial. What I want to do, but don’t have the right devices right now, is compare the HTC to Nexus 5. I believe the N5 camera is underrated. Something else to consider: I work on Chromebook Pixel, which is where my photos are edited. There are so many tools available for improving images—even jpegs. I edited the photo above using Pixlr Express, applying Filter “Ingrid”, which pops detail and contrast. You’d be surprised how many seemingly bad cellular handset photos can be turned into phone art, even using tools in the cloud rather than apps on device, laptop, or tablet.